Last week, my aunt Jill died at age 53. She had multiple myeloma, a blood cancer caused by malignant plasma cells. Her cancer was incurable and aggressive. 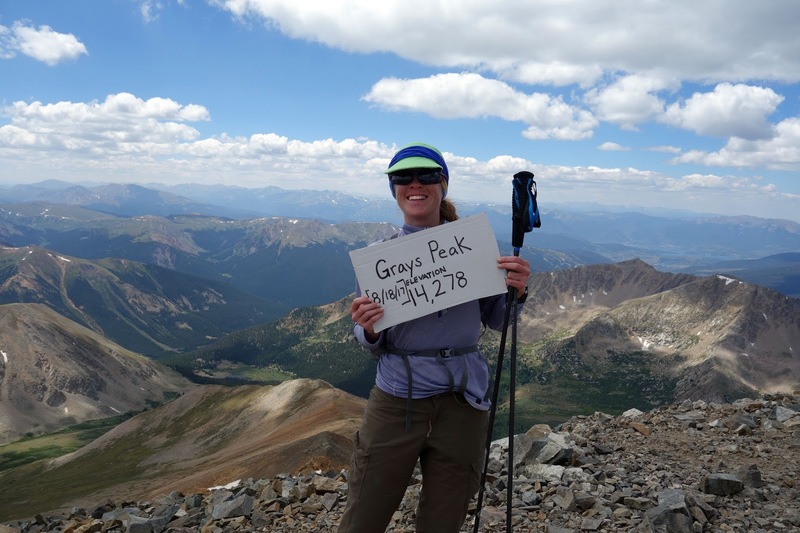 She battled for three years, trying every treatment and several clinical trials. From afar, the treatments seemed painful and isolating. She must have felt hopeless at times, but she was brave. When faced with the prospect of a painful stem cell transplant that had only a small chance of success, she said, "this might not extend my life, but it will help doctors learn more about these treatments for the future." We shared the same name, Jill Homer. When I was a child, she impressed on me the value of finding joy in everything. My grandmother had given me some kind of chore after Thanksgiving dinner. I don't remember the chore, only that I was unhappy because I wanted to play with my cousins. My aunt said, "Don't look at it as punishment. It's just another type of adventure." I'm paraphrasing. The word adventure is probably something my memory inserted years later. But that was my aunt. Life is a great adventure, whether you're zip-lining down from dizzying heights (a thing she decided to do shortly after being diagnosed with cancer) or doing the dishes. I decided to drive out to Utah for the funeral this weekend. It was a beautiful service, attended by all of my aunts and uncles and a large number of my many cousins. As the years pass, I realize more how much I value my big Mormon family with our often messy and loud gatherings, the jello salads and funeral potatoes. It was nice to spend an afternoon with them and learn more about Jill's final weeks. Death inevitably leads to reflection about the fleeting nature of life, and its sources of joy. Jill never stopped embracing beauty, even when she was in pain. 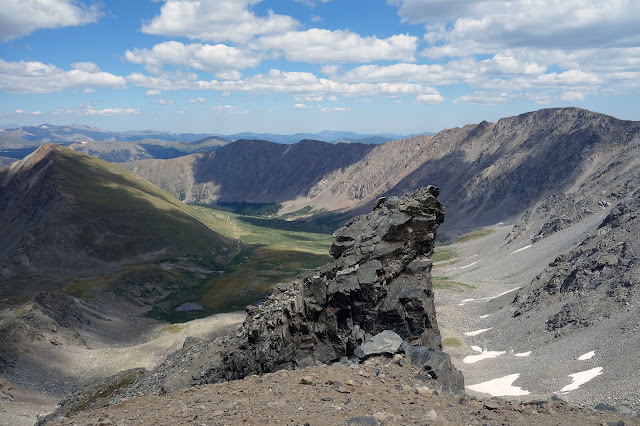 In her spirit — or really, in my spirit, but I think we shared a lot of the same values as well as a name — I took advantage of the road trip to squeeze in a little adventure on two 14ers near the Interstate, Torreys and Grays peaks. 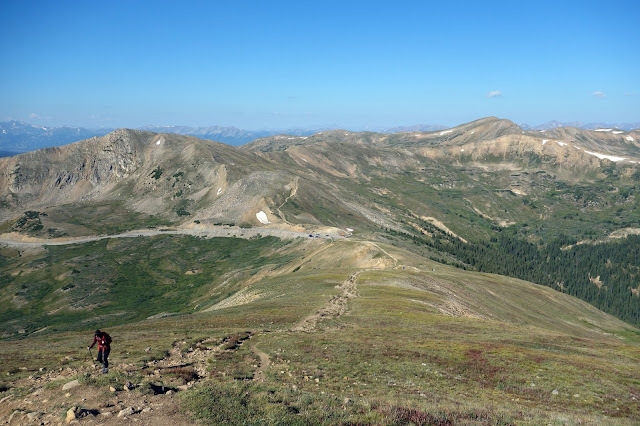 Looking at a map, it seemed there was a more interesting route than the standard trail, starting from Loveland Pass. 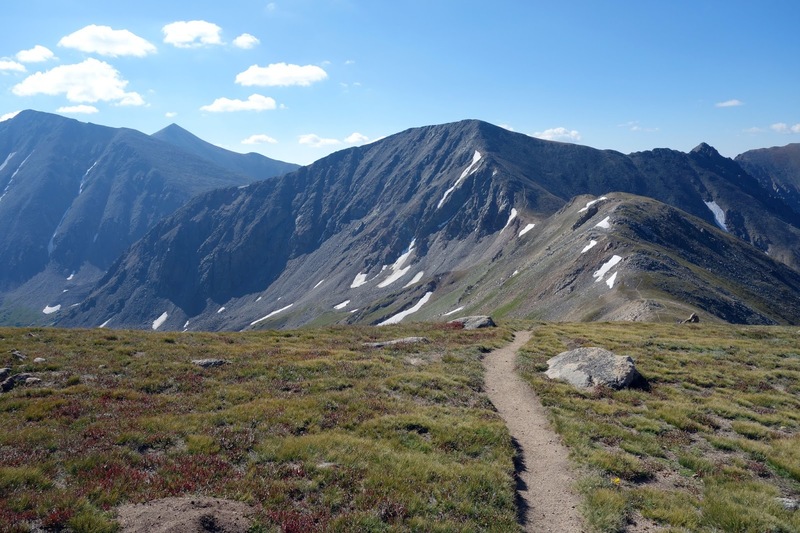 This route included a lot of climbing and descending and two smaller (13er) peaks in the way, but bonus: You start above treeline, just below 12,000 feet. Views the whole way. And ridge walking! Right out of the car I felt a bit rough — nauseated, mostly. My breathing was actually fine, despite the altitude. I slogged along and tried to eat some fruit snacks, but despite the stomach grumblings I felt pretty good. 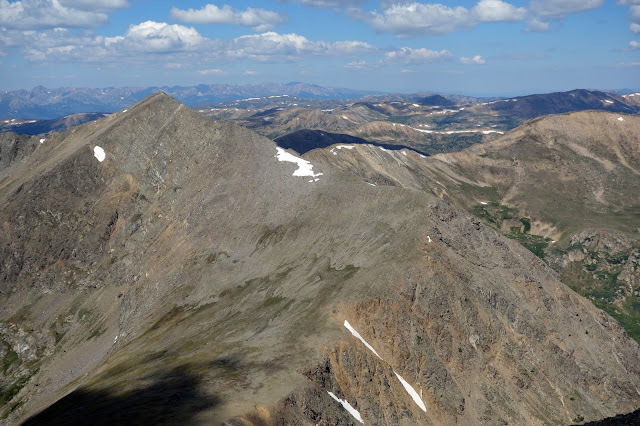 Sunny day, perfect weather forecast, and a trail to two 14ers with nobody on it. What more could you ask for? Looking toward Torreys and Grays from Grizzly Peak. Right off this ridge was a steep descent on loose talus, and I took a fall. It wasn't that bad. I have what I consider a "bad ankle," my left ankle, which I broke when I was 19. It's been the weak one ever since. I've been rolling it a lot lately, and I rolled it on top of a loose boulder and crumpled onto a thankfully smaller pile of rocks with my head downhill. I rose with no injures (save the tailbone I bruised when I fell down the stairs last week, which still hurts.) But I was dizzy and disoriented and really, really spooked. Why was I so spooked? It's difficult to justify now. I wasn't hurt and this wasn't terribly difficult terrain. Despite this reality, I was remorseful. "Why do I always go to the mountains? I'm not good in the mountains at all, and they scare me. Why, oh why, oh why?" 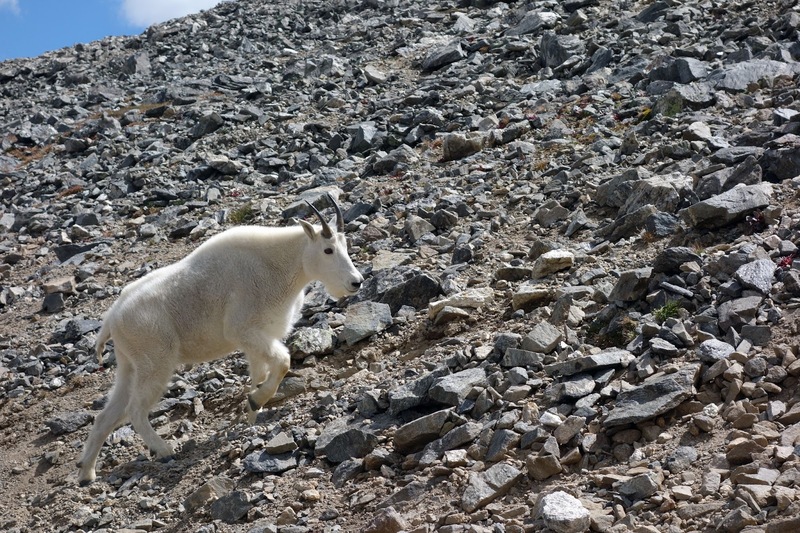 I inched my way down Grizzly's talus field and started up a new one to summit Torreys. This route that gains 1,700 feet in less than a mile, topping out at 14,275 feet. I tried to shake how spooked I felt, unsuccessfully, and struggled mightily with this climb. I stumbled to the summit with at least 15 people on top, and pointed out my ridge route to a guy who asked where I came from. 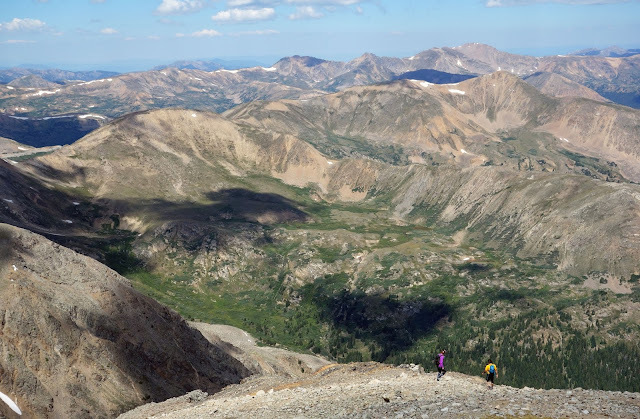 "I'd like to do that someday, but it's not a day hike," he said. I looked at my watch. "I've only hiked five miles so far." Three and a half hours had passed. I still had more than six hours of driving ahead of me, and this hike was already taking much longer than expected. Of course you can't go to Torreys without tagging Grays, so I was looking at eight hours of hiking, which one might think unreasonable on top of a 530-mile drive. I would disagree. My aunt Jill might disagree. But I was admittedly terrified of returning to Grizzly, and already plotting an alternative. Perhaps, I thought, the faster way back from this mountain is around it. Holding a borrowed sign on Grays, looking disheveled as usual. Six miles in four hours. I knew if I dropped down the popular trail, I could potentially run the gravel road, bike path, and a supposed trail along Highway 6, all the way back to my car. It was 15 miles instead of six, wasn't a beautiful ridge walk, and promised to be a slog of a gradual climb from the Interstate. But if I could run, I might arrive in Utah before 1 a.m. This descent was fun. 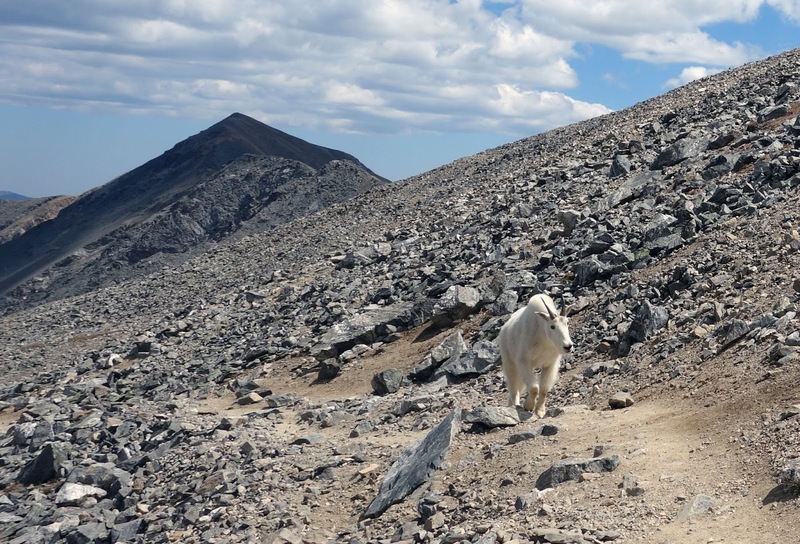 A herd of mountain goats sauntered along the trail (I've seen mountain goats three times in Colorado, always along popular routes to 14ers. It's like they want to be around people.) The trail was rocky and steep but mostly mindless. I finally felt comfortable turning on my iPod and shuffling along, although my bad ankle was throbbing, and I was still nauseated. Running was going to prove difficult. Dang, it was going to be a long walk back to the car. Unfortunately I didn't start to feel better, and I ran out of food because I had banked on a four- or five-hour hike, not eight. The bike path on my map turned out to be paved, which was an unpleasant surprise. 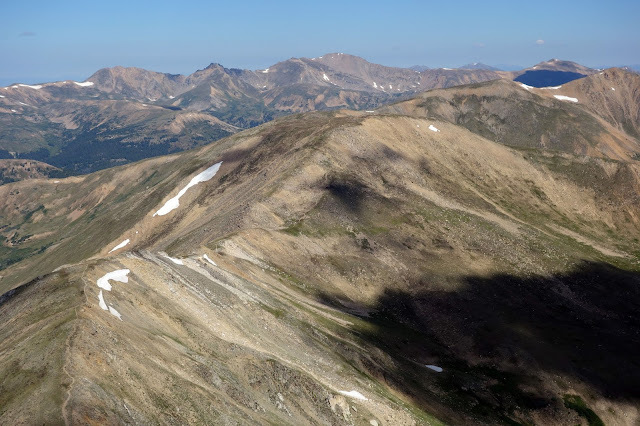 I slogged along on hot and sore feet, at least managing 18-minute miles with not too much effort (curbing the nausea), and scrolling through my map while pondering potential stream bed gullies I could climb back to the ridge. ("Don't do that," I reminded myself. "You'll regret that.") 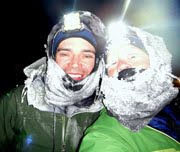 There was just enough shuffling to wrap up the 20-mile hike in eight hours, and not feel too worse for the wear. Better to not be shattered before the drive. Driving west into the setting sun, I felt slightly ashamed for how poorly I'd reacted on Grizzly. Maybe it's an inherent knowledge that something small like a weak ankle could prove deadly in the wrong place. Maybe I'm hurt because I love the mountains so much, but I'm just a feeble thing pressed against cold, sweeping indifference. Why do I go to the mountains? Because they're beautiful. And because I'm not very good in the mountains and they scare me. My aunt Jill might point out that perspective is what matters. "Why do I go to the mountains? Because they're beautiful. And because I'm not very good in the mountains and they scare me." Years ago I decided stairs are one of the most dangerous things we do on a daily basis and I've tried to train myself to always use the railing and be "mindful." And I've trained my dogs to go on the outside of me! Are you doing any ankle maintenance exercises? I badly sprained one while skijoring over ten years ago and continue to do the ankle lifts (ironically, using a stair step). First one leg at a time for a few sets then using both. I'm sure there are more effective and additional ones, but this is simple and I can read while I do it for about 10 minutes, five times a week. I also still use a balance platform (big half-ball underneath), rotating it 360 degrees, several sets each direction, a couple of times a week. Then some squats while on the platform. Those were originally to rebuild muscle memory for better support. I think they've made a difference. The trick is to find something you can tolerate and will stick with long-term, and don't end up doing nothing because there may be better exercises you could be doing. Do check with a trainer at your gym for technique tips so you get the maximum benefit. 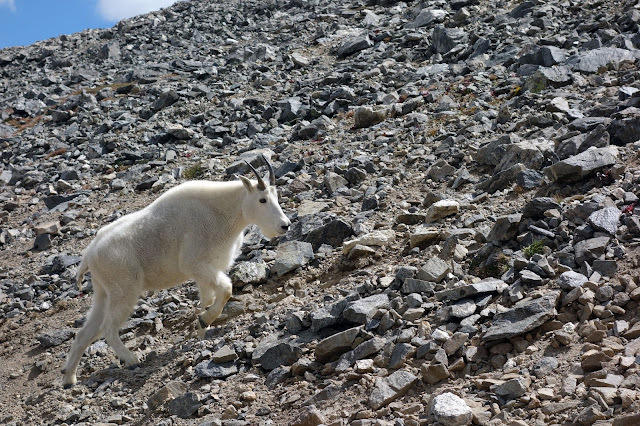 Amazing pics Jill...can't believe you were close enough for those mt goat pics w/ a point n shoot...they are SO beautiful! (I'm from Montana and have only seen them once or twice in my life). Sorry to hear about your aunt...but glad you were able to make the trip to reconnect w/ family..that's really important! 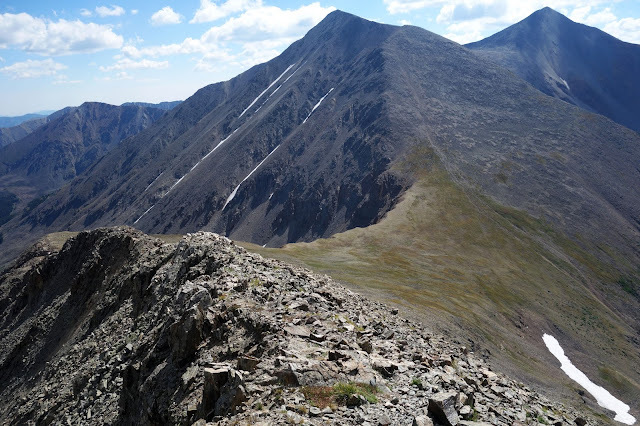 AND you slipped in a little mt hiking and nabbed two more 14'ers (even w/ a turned ankle) is a nice bonus! I love the high country but can't see myself doing it alone...you are amazing! You don't let your fear stop you from doing things (do you carry your SPOT w/ you when you do these things? I find my SPOT really lets me feel a lot more comfortable mt biking alone, as I'm not REALLY alone...I can call for help anytime/anywhere if I really need it). Oh...and happy bday too! Oh...and 20 miles in 8 hours? Jeez Louize...and w/ a turned ankle? At altitude? You blow my mind yet again! My dad died of multiple myeloma in 1996. He was 64. Condolences.